Wrongful Discharge From IA Nursing Homes Can Be Catastrophic | Hupy and Abraham, S.C. 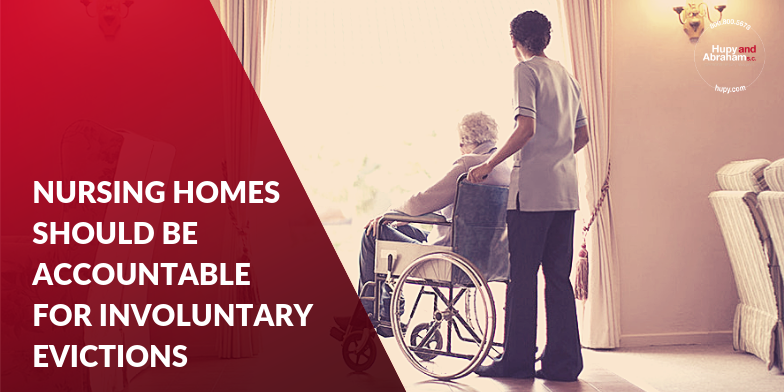 Nursing homes have a duty to provide care for nursing home residents. When nursing homes abruptly and wrongfully end that care without proper cause and without following proper procedures, serious injuries can result. The closure of a nursing home. When the resident doesn’t pay for nursing home care—except in situations where Medicare is pending. When the resident no longer needs skilled nursing care because the resident’s health conditions have improved to the point where the care is no longer medically necessary. When the resident’s health has declined, and she needs additional care that the nursing home cannot provide. When a discharge is necessary for the welfare, health, or safety of the resident of others. If one of these conditions exists, then the nursing home must still follow specific procedures to discharge the resident. Give 30 days written notice of the discharge plan and the reason for the discharge, unless an emergency situation exists. Provide for the safe and orderly transfer of the resident. Provide notice of whether the resident’s bed will be held and readmission requirements. Allow residents to appeal a discharge that they believe to be unlawful. Have a grievance procedure that can be used by residents who believe the discharge to be unlawful. A nursing home that does not follow these required procedures or that does not have a legally valid reason to discharge a resident may have committed a wrongful discharge. Left without anywhere to live or anyone to care for her. Left without necessary medical care. Unable to eat or take care of personal hygiene. This can result in serious injuries such as infections, illnesses, disorientation, and even death. If your loved one’s nursing home did follow proper procedures or did not discharge your loved one for a legally valid reason and your loved one got hurt as a result, then it may be up to you to take action. You may need to be the one to find an experienced nursing home injury lawyer and to help your loved one who has been the victim of nursing home abuse or negligence. This task should not, however, add additional stress to your life. You have enough on your plate trying to make sure that your loved one has a safe place to live. Once you find an experienced nursing home injury attorney who is willing to fight to protect your loved one’s rights, then you may be able to breathe a little easier knowing that the nursing home will be held accountable and that your loved one’s potential recovery will be protected. Our experienced nursing home lawyers will fight for your loved one’s fair recovery of damages if she has been hurt by a wrongful eviction from her nursing home. That recovery could include damages for her past and future medical costs, lost income, physical pain, and emotional suffering. It can also send a strong signal to Iowa nursing homes that proper discharge procedures must always be followed. To learn more about your loved one’s rights, please call, text, or email us today for a free, no-obligation consultation. You can also learn more about your loved one’s rights immediately by downloading our informative and free Guide for Nursing Home Abuse and Neglect Victims: What You Need to Know to Protect Your Legal Rights and Get Every Dollar You Deserve.